Bird and wildlife watching opportunities associated with the St. Johns River, it's tributaries and Upland Woods Habitats along Florida's Space Coast. Located behind the Community Center and next to the Palm Bay Library at 1502 Port Malabar Blvd. NE, Turkey Creek Sanctuary is over 100 acres of natural Florida along the banks of Turkey Creek. There are jogging paths and a boardwalk through the woods and overlooking the creek with a canoe launch on site. The property is 17.7 acres with about 1000 feet of frontage on Turkey Creek. There is a short boardwalk with a creek overlook and trails into the uplands. FROM I-95 Exit-173 take SR-514-Malabar Road west 6 miles and turn right into the park road. Open after 7:00 a.m. until dark, except for scheduled use. Four lakes for fishing, viewing wildlife, some pine flatwood forest on property. Sightings include deer, turkey, alligator, snake, duck, sandhill crane, owl, migratory songbirds, and others. From I-95 take Exit-173 Malabar Rd SR-514 and go east on Malabar Road about 3.1 miles. Turn left on Malabar Woods Boulevard. Trailhead is located at the end of the road. Kiosk and stabilized parking available. This 395 acre sanctuary managed by the Brevard County Environmentally Endangered Lands Program boasts a variety of habitats including xeric (dry) hammock, scrub, scrubby flatwoods, pine flatwoods, sand pine scrub, ponds, sloughs, and depression marshes, and allow visitors to learn how the habitats interact with each other and about the crucial role that fire plays in health of the ecosystem. This property has a network of trails through the habitats and the species on site include Florida scrub jays, indigo snakes, gopher tortise, river otter, great horned owl, pileated woodpecker, sandhill crane, bobcat, and migratory songbirds. An ADA trail runs adjacient to the main entrance road to allow access for the physically challenged. End of Marie Street, Malabar. From I-95 take SR-514 Exit-173 east onto Malabar Road. Go 3.6 miles and turn right on Marie Street (3 miles past the fire station) and go 0.9 miles. When the paved road ends, continue to the Sanctuary gate and kiosk. Bike rack provided. Parking is not available. From US-1 go west on Malabar Road for 0.5 miles and turn left onto Marie Street for 0.9 miles. When the paved road ends, continue to the Sanctuary gate and kiosk. A variety of habitat types are found in this 354-acre sanctuary. including scenic lakes, seasonal marshes, and scrubby flatwoods. While hiking through the diverse habitats, bald eagles can be spotted fishing for meals in the lake, and local scrub-jays seen foraging in the scrubby flatwoods. Recreational planning for the Jordan Scrub Sanctuary recently commenced-additional trails are planned for future development. From I-95 take the Malabar Road Exit-(FL-514) east and turn right on Babcock Street SE. Go south about 7 miles. Turn left on Micco Road and go about .75 mile east. Look for fenced, grassy parking area on the left. From US Hwy 1 go west on Micco Road 6.3 miles. Look for grassy parking area on the right. The Micco Scrub Sanctuary protects 1322 acres of Brevard’s remaining scrubby flatwoods and mesic flatwoods habitat. This mosaic of seasonal marshes and dry flatwoods shelters many indigenous species of plants and animals that cannot be found anywhere else in the county. The long trails running through the Micco Scrub Sanctuary give hikers many chances to spot wildlife. At 21,748 acres most of this property is jointly owned with the State of Florida and is located in Brevard and Indian River Counties. From I-95, take exit 73 and go east on Malabar Road (State Road 514). Turn south onto Babcock Road (County Road 507), travel 11.5 miles and turn east onto Buffer Preserve Drive. The south entrance is off Fellsmere Road (CR 512), 1.8 miles east of I-95. This site preserves open grassy forests of longleaf pine that were once commonplace throughout Florida. The pine flatwoods form a backdrop for other biological communities, including cypress domes, scrubby flatwoods, sandhills, and a beautiful strand swamp. These habitats are home to many native plants and animals, including over 50 protected species. Photographers, bird-watchers, and nature enthusiasts can explore miles of trails on foot, bicycle, or horseback. Also in the preserve where the C-54 Canal meets with the St. Sebastain River, West Indian manatees can be see congregating. The preserve is divided into four sections with the north and south sections divided by the C-54 Canal and east and west bisected by I-95. They are known as the Northwest Preserve, Northeast Preserve, Southeast Preserve, and the Southwest Preserve. The Northeast Preserve is home to the Green Trail loop (9.0 miles) but has no designated campsites. The Northeast Preserve is home to the Yellow Trail (9.7 miles and has two camps, the Storytelling Camp and the Pine Camp. The Southeast Preserve is home to the Blue Trail (10 miles) and has 3 camps, the Deer Camp, the Tree Frog Camp, and the Mullet Camp. The Southwest Preserve is home to the Red Trail (14 miles) and has one camp, the Eagle Camp. For information about the Visitors Center or Camping, please call 321.953.5004. The Upper St. John's River Marsh Wildlife Management Area extends from State Road 520 west of Cocoa and extends down to encompass the headwaters of the St. John's River and Lake Blue Cyprus. Consisting of more than 119,000 acres in Brevard and Indian River counties, the Wildlife Management Area is jointly owned by the State and the St. John's River Water Management District (SJRWMD). The Florida Fish and Wildlife Conservation Commission (FFWCC) primarily manages and controls hunting within the property while the Water Management District controls habitat restoration and recreational activities during non-hunting times. For these purposes the District has divided them up into several different Conservation Areas, Three Forks, Blue Cypress and Fort Drum. The access points will be discussed for each individual conservatoion area starting just below. Of special interest to boaters and kayakers are the 7 designated campsites and camping platforms within the Three Forks Area. These will be discussed farther on the Backcountry Camping Pages. There are two primary trailheads for birding the three forks conservation area. The northermost trail head is the Thomas O Lawton Recreation Area and can be accessed from the Malabar Road exit from I-95 and following Malabar Road to it's west end. Gates open at sunrise and close at sunset. The southern trailhead is at the Fellsmere Grade Recration Pad at the Sick Marsh / Farm 13 area. and can be accessed from I-95 by taking the east exit for Malabar to Babcock Street, turn south on Babcock until you cross the C-54 Canal, turn west on the Fellsmere Grade Road and follow this to the end. Three Forks Conservation Area is about 52,000 acres in size and it is within this area that the first actual discernable channels of the St. Johns River take shape in the form of three forks that come together to form the actual river. The birdwatching here is done from hiking and biking trails built upon the levees constructed by the St. John's River Water Management District in order to improve water quality of the headwaters and restore the river to its natural state after years of draining the wetlands for agricultural use. The water management impoundments provide great opportunities for seeing waterfowl, wading birds, raptors, deer, alligators, river otters, and many other species. The dike trail between the two trailheads is about 16.9 miles in length. There is a shelter about halfway between the trailheads, and an observation tower about 2.5 mile north of the fellsmere grade trailhead overlooking the T.M Goodwin Waterfowl Management Area. Note; The Fellsmere Grade Trailhead also serves as the northernmost trailhead for the Blue Cypress Conservation Area listed just below. This conservation area is 54,458 acres in size and extends from the Fellsmere Grade along C-54 Canal at the top of the Stick Marsh southward to State Road 60 west of Vero Beach in Indian River County. The area contains virtually all of the wetlands that eventually feed the St. Johns River. Like the Three Forks Conservation Area the birdwatching here is done from hiking and biking trails built upon the levees constructed by the St. John's River Water Management District in order to improve water quality of the headwaters and restore the river to its natural state after years of draining the wetlands for agricultural use. The water management impoundments provide great opportunities for seeing waterfowl, wading birds, raptors, deer, alligators, river otters, and many other species. 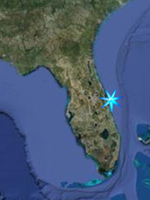 The northern trailhead for Blue Cypress is at the Fellsmere Grade Recration Pad at the Sick Marsh / Farm 13 area. and can be accessed from I-95 by taking the east exit for Malabar to Babcock Street, turn south on Babcock until you cross the C-54 Canal, turn west on the Fellsmere Grade Road and follow this to the end. While heading north from the recreation pad / trailhead on the levee take you to Three forks Conservation Area, heading south on Levee 75 (L-75) from this point takes you along the eastern edge of the Stick Marsh. The Stick Marsh is an impoundment designed to contain and treat water from the C-54 Canal, prevent flooding, and reduce freshwater inflow into the Indian River Lagoon to the east. The name Stick Marsh refers to the standing dead trees in the water from when the area was impounded and flooded. However, many of these standing dead trees were blown down by Hurricane Wilma in 2005. By continuing past the stick marsh on L-75, you will eventually come to a turn to the east and shortly come to a levee intersection with L-77, which takes you to an additional trailhead on State Road 60. If you stay on L-77 east, you are now walking along the northern edge of the Blue Cypress Restoration Area. After about 1.5 miles, L-77 turns to the south and passes a trailhead / boat launch and parking area for access to the Blue Cypress Restoration Area. Blue Cypress Restoration area is an impoundment adjacent to the Blue Cypress Conservation Area designed to improve the water quality of the Upper St. Johns River and is a deepwater cypress wetland where a paddling and small boat series of loop trails has been marked by red and white buoys, depending on which trail you are on. From the parking lot of the Blue Cypress Recreation Area on CR 512, you may walk in several directions. One of the westbound dikes will offer more remote, sometimes higher quality birding. However these paths are narrower with irregular surfaces. A north-south dike offers a smoother walking surface, although the path is more exposed and birds are harder to spot. It should be noted however that the dikes heading east from the parking area are Private Property and tresspassing is not allowed. This area contains foraging and nesting habitat for the endangered snail kite and many other species can be seen here as well including all of the egrets and herons (including both night-herons), glossy and white ibises, purple gallinules, limpkins and wood storks. Wood ducks and Florida mottled ducks are found year-round, and the marshes are used extensively in fall and winter by migratory waterfowl and shorebirds. Bald eagles, hawks, vultures, anhingas, ospreys and crested caracaras are commonly seen. American and least bitterns, king rails, soras and fulvous whistling-ducks may be viewed here as well as river otters and alligators. This area contains a mosaic of wetland and upland communities. The marsh area represents the southernmost reach of the St. Johns River’s headwaters. The area was acquired as part of the Upper St. Johns River Basin Project, undertaken jointly by the District and the U.S. Army Corps of Engineers. The diversity of plant communities has been shaped by both people and nature. Natural communities include dry prairie, pine flatwoods, hardwood swamp and freshwater marsh. The diverse habitats support Florida sandhill cranes, wood storks, caracara, bald eagles, deer, turkey and a large population of feral hogs.